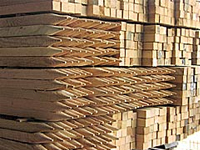 We produce our own rough cut lumber here on site. After removing the bark from the log, we saw it into boards as requested by our customers. 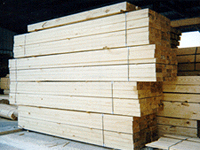 We can produce lumber from six to thirty-five feet in length, and up to 20 inches in width. The majority of what we saw consists of hardwoods. We do saw some eastern white pine, as it becomes available. Hardwoods include red and white oak, poplar, ash, hickory, walnut, cherry, basswood, maple, beech, birch, locust, sassafras, and gum. 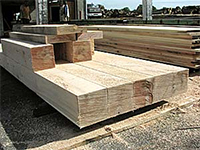 Some of the more common uses for our lumber include house and barn beams, board and batten siding, side boards & floor boards for trucks, blocking and crating lumber, dock bumpers, concrete form boards, benders and straights, fireplace mantels, fence posts, shoring lumber, and bridge beams & decking. We are a cut-to-order mill and will cut to your specifications. Click here for a listing of our products. Our air dried lumber is primarily 1" (4/4) in thickness. We carry red and white oak, poplar, ash, walnut, cherry and basswood. We also stock thicker basswood used for carving projects. We carry a supply of flitch cuts with a free form edge in walnut, cherry, and maple for fireplace mantels or countertops. The flitch cuts generally range from 2"-4" in thickness. Other odds and ends are available for making clocks and plaques. Kiln dried cherry and hard maple (4/4) from Northern Pennsylvania is also available. The treated lumber is treated with a copper azole preservative. The pressure treating is not performed here. We specialize in 4x4, 4x6, 6x6, 6x8, and 8x8 sizes with lengths from 8' - 16' depending on the size. 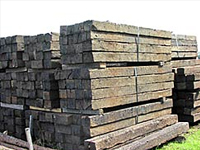 Our railroad ties are used creosoted ties with at least three good sides and measure approximately 7"x 9" x 8.6'. Some common uses include landscaping, retaining walls, and parking lot guides.The ties weigh approximately 200 lbs. each. We have two different types of firewood available. First, we have the regular split wood (all hardwood) for pick up or delivery. Second, we have slabwood which is also cut to firewood lengths (approximately 16"). The slabwood is part of our manufacturing process and consists of the first cuts off the sides of the logs as we are sawing. The bark has already been removed and the pieces are then cut to length. Some of the pieces are wider and thicker compared to the split wood, and this is also available for pick up or delivery. Please call for pricing on both split and slabwood. 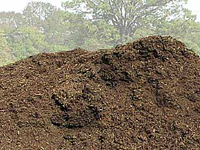 We carry different types of mulch: playground, triple ground and black mulch. The playground mulch (wood chips) is less fine in size and texture than the other two types and works well for playground areas or for walking paths. The triple ground is a darker landscape mulch. The black mulch is also a landscape mulch with environmentally safe color added to help prolong the color of the mulch. Mulch is available for pick up or we can deliver it for you. Please call for pricing as we give price breaks for larger quantities being ordered. To help calculate how much material you may need for your project see below. As we run our sawmill, byproducts are created in the form of sawdust, bark, and wood chips. 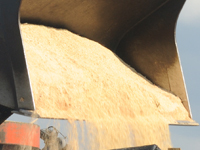 The sawdust is used primarily for animal bedding. We separate out the walnut sawdust. Sawdust is available to pick up or we can deliver it for you. However, please call ahead to make sure we have enough for your needs. Our supply tends to be limited during the winter due to higher demand. 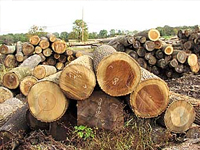 In addition to sawing lumber to your specifications, we can saw your logs into lumber for you. 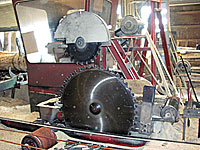 Our rate is $6.00 per minute, with an average log (8'-12' in length, 12"-18" in diameter) taking five minutes to saw. Logs are first examined with a metal detector. Time required to extract any metal from the log will be added to the total cost. We have a minimum charge of $40.00 for custom sawing. We are looking to buy standing timber that people may have on their property. 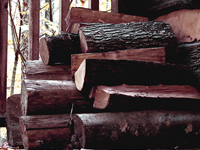 Heacock Lumber offers logging, hauling, and woodlot management services to landowners. We do not practice or condone clearcutting of timber! As a member of the Sustainable Forestry Initiative of PA, we encourage taking the long term view by preserving timber resources for the needs of future generations. We produce our own survey stakes, tree stakes and tomato stakes on site. We use lumber from our sawmill to produce a good quality hardwood stake. Pick them up yourself or arrange for us to deliver them. We also carry survey supplies such as flagging tape, marking paint, stake flags and tacks, field books, etc.